4.9/5 out of 193 votes. Fu dogs will guard your house from all the negative energy. If you have ever been in China, you must have seen them: a pair of ferocious, flat-muzzled, lion-like stone creatures that stand at both sides of entrances and paths. These are fu dogs, also called buddha's lions, mythical guards of the homes since ancient times, still popular everywhere in Asia. Fu dogs, just like their living brethren, guard homes from negative influence, even when their owners are far away. Just like with real dogs, the size of fu doesn't really matter: even smaller dogs can do their work properly, although it is better when the size of the house and the size of dogs are in good proportion. 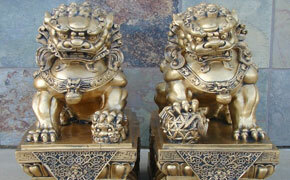 It is easy to find a couple of fu dogs in any statue shop or in a Chinese shop. You can place the couple at the entrance and on the pedestals for them to better observe and light them over nights.